When it comes time to consider a new smartphone, UTStarcom cell phones may not be the first products to come to mind. You may be more interested in the ubiquitous BlackBerry or maybe an Android phone, but that's not to say that UTStarcom didn't have some decent offerings to appease your touchscreen telephony needs. They even had a good batch of entry-level mobile phones that appealed to the "no frills needed" user. Check out some of these UTStarcom cell phones below. UTStarcom was formed in 1995 when UniTech and Starcom merged. They are perhaps better known for their VoIP (voice over IP, or "internet" phone) solutions, especially those conforming to the SIP (Session Initiation Protocol) standard, rather than the slightly better known Skype service. The UTStarcom F1000 is a Wi-Fi enabled handset designed for VoIP, and it is resold by a number of service providers like SIPGate, BroadVoice and PeopleCall. Although UTStarcom (official company website) is officially based out of Alameda, California, many of their key officials and offices are overseas. More specifically, the company has a very prominent presence in China, as well as in Korea and India. The UTStarcom cell phone business grew substantially after November 1, 2004 when they purchased the cell phone subsidiary of Audiovox known as Audiovox Communications Corporation. Much of their cell phone focus was on handsets using CDMA-based networks. However, all of that came to an end in July 2008 when UTStarcom announced its complete divestiture of its Personal Communications Devices (PCD) division. This included all of its mobile phones and everything to do with that business. This freed up UTStarcom to focus more of its energies on its core IP product lineup. This was perhaps the best known UTStarcom handset out there. Powered by Windows Mobile 5.0 Phone Edition, this Pocket PC Smartphone came loaded with plenty of functionality, including a full suite of Windows Mobile software. The touchscreen interface made using this handset an absolute breeze, but when it came time to input some text, the slide-out QWERTY keyboard certainly came in handy. The built-in camera captured 1.3 megapixels of imaging goodness, featuring flash and macro functions, as well as video capture. Other key features included Bluetooth, speakerphone, photo caller ID, integrated MP3 player, vibrating alert, and polyphonic ringtones. Several mobile network operators carried this lesser-known handset, including Verizon Wireless, Alltel Wireless, Sprint-Nextel, and Telus Mobility. Pricing ranged from $100 to $270, depending on service plan, contract length, mobile provider, and so on. Unlike the Vertu sub-brand of Nokia or the classy nature of certain Samsung Cell Phones, UTStarcom Cell Phones were clearly targeted at the lower end of the market. They typically didn't boast the latest and most powerful features, opting more for simple, straightforward designs and a "no bells or whistles" spec sheet. Here are a few examples of the budget-friendly offerings. UTStarcom 860: A no nonsense candybar with about as affordable a price as it gets, the 860 was offered for as low as $0 (yes, free). Nothing to floor you here, but you did get a 0.3 megapixel camera (VGA), internal antenna, text messaging, downloadable ringtones, and a 65k color display. The red accents gave it a touch of personality too. 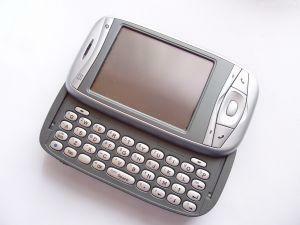 UTStarcom Slice: Available through Virgin Mobile, the "Slice" (also known as the PCS-1400) was a razor-thin candybar phone with styling reminiscent of the Motorola SLVR. They skimped on the features however, with a complete lack of a camera or Bluetooth. Instead, you got 32MB of internal memory, a speakerphone, and a slick looking keypad. On the plus side, it was very affordable at just $50. UTStarcom CDM-180: It was not the skinniest phone on the block, but the CDM-180 was one of the most compact packages out there. They squashed the proportions to provide a 1.2-inch TFT display that is squinty-eyed, landscape-oriented, and 262k color. The CMOS VGA cam wasn't the best, but the retractable antenna might have helped you get better reception.